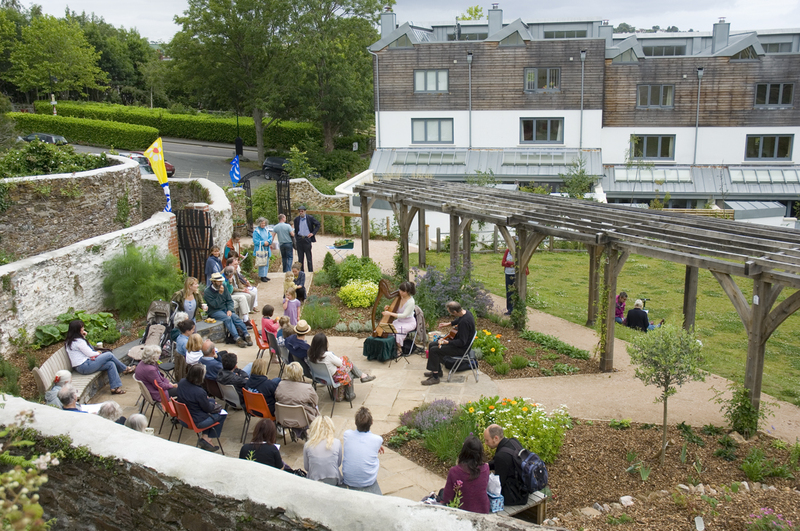 Visitors to Totnes' Food Market on 19th June joined local residents for a delightful musical lunchtime performance given by harpist Misuzu Matsumoto and her husband John Caley (of the Exchange, High Street) in the peaceful setting of Leechwell Garden's newly planted herb garden. Sue Holmes, member of both Leechwell Garden and Totnes Healthy Futures projects, said "The afternoon has been a great success. We are so grateful to Misuzu and John for giving their time to help us celebrate and review the progress of the Healthy Futures project at the Lamb. This is, we hope, the first of many joint activities between the two sites. More than 60 people came to the free event, including lots of children, and all appreciated both the lovely music and the Garden on a warm summer's afternoon." Catherine Munro, events co-ordinator for both sites, also gave visitors lots to think about, with a stall packed with information on food growing and healthy living, a plant identification quiz and project questionnaire, as well as free plants grown at the Lamb to take away. "Anyone is welcome to join us at the Lamb on Monday afternoons between 2.00pm and 4.00pm for the new Summer and Autumn Gardening for Health schedule, and volunteers can get together on Wednesday afternoons and Saturday mornings to help improve and maintain the site", she explained. "We now have a new information board giving details of all our courses and activities, and further details can be found on our website at www.totnesdevelopmenttrust.org.uk." At the end of the afternoon's activities, many visitors continued along the Garden Trail, which links Heath's Garden, Leechwell and the Lamb Gardens through Leechwell Lane. Free trail leaflets and map are available at the Tourist Information Office, in the library and from Harlequin's bookshop. Leechwell Garden is also the venue for the popular free weekly Tai Chi classes on Wednesday afternoons. For further information on all these activities, or if you would like to volunteer for either project, please phone Catherine Munro on 0758 2125438.